With general advice on trends to full wardrobe edits, and with years of experience and knowledge in shopping for your body type, colour-matching your skin tone, and shopping for your personality and taste, you’re in good hands. Enjoy acompleted fashion consultation in the Style Suite, a Laura Ashley-decorated ‘fashion retreat’ featuring plush carpet, silk taffeta drapes, comfortable velvet armchairs and bevelled-edge mirrors, the perfect setting for pampering before hitting the shops. Meet the Burnside Village stylist. Cimon Vozzo is a freelance editorial, personal fashion stylist and fashion blogger. She is a lover of all things Adelaide and of course fashion. Cimon has always had a precise eye for fashion whether it is fashion editorials or even personal styling she loves helping women and men shop for their body shapes. She is a trend setter not follower, but seeks her fashion inspiration from overseas trends. 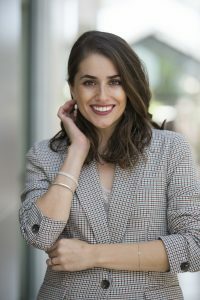 She has worked for The Sunday Mail as fashion editor, exciting projects like fashion runways, worked with top Australian influences and has been featured on Adelady television show. You will see her around the village collecting stock for an up and coming fashion editorial or even a fashion parade. To book a style session, fill out the form below.